If you own a milkshake or juice shop and want to decorate it with some great looking fruits or vegetables, artificial carrot can be top of the list to put on. However, you can’t use the original carrots to make your juice corner looking great, for this you would need some artificial carrots. If you are in need of artificial but original looking carrots, AmazingProduce.com is here to help you. We sell a wide range of fake vegetables and carrots are one of them. You can put these fake carrots in a basket or bowl to put them on your dining table or make your juice shop look natural. Our set of plastic carrots is perfect for decoration, accenting garden or centerpieces. Also, these are suitable for decoration at home, garden, restaurant, supermarket, hotel, office and so on. 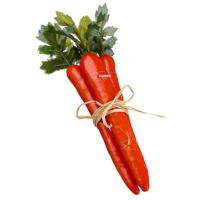 The carrots are perfect and size and color and made of quality material that looks natural.